The Corvair 5th Bearing Kit was originally designed by Dan and Jim Weseman to reduce the bending loads the propeller generates during flight and direct them into the case. In stock form the loads are taken between the #4 crank bearings and across the #6 rod throws. This configuration puts the load into the new 5th and #4 bearing, taking the bending loads off the over stressed #6 rod throw and directs it to the new front housing and engine case. SPA has over 320 combined Generation 1 (Retro Kits) and Generation 2 5th Bearing kits installed on engines to date. 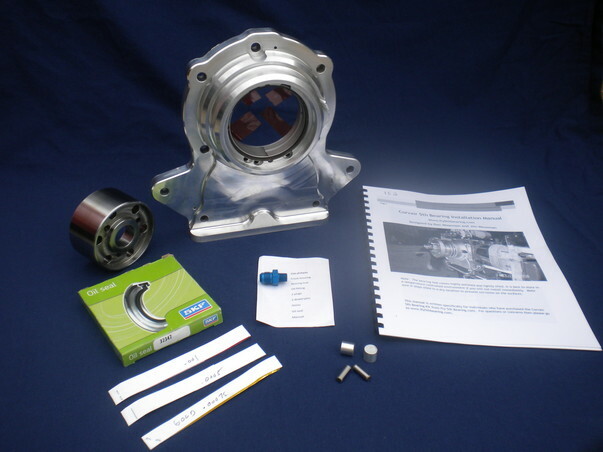 Our Corvair 5th Bearing Retro Kit is designed to be installed on assembled Corvair flight engines. Our Corvair 2nd Gen 5th Bearing kit is a single piece 5th bearing Journal/Crank Gear and Housing kit for new engine builds. 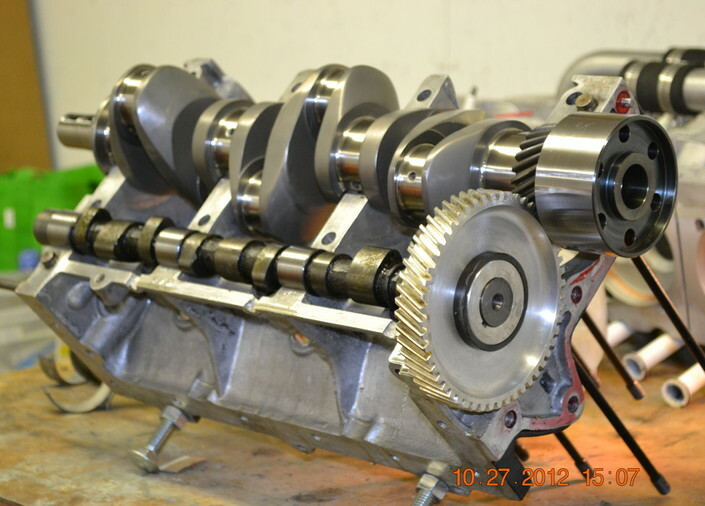 This unit is pressed on as part of our Crankshaft Service or on your serviced crank, or our New Billet Crankshaft. Then ground as a unit with the crankshaft. This ensures concentricity with the crankshaft and eliminates the need for adjusting the run out during installation. Dan got into the Corvair movement during the initial stages of building N183SX the Cleanex. He was looking for a economic engine to power the Sonex he was building. To make a very long story short he meet William Wynne and decided to use the Corvair engine on his airframe. After flying a 3100cc William Wynne style Corvair for about 40 hrs the crankshaft failed. Around this time several others had also cracked crankshafts. They then turned to Nitriding to help increase the fatigue life of the crankshaft. That worked well but in early 2008 our friend Chris Smith (Son of Cleanex) and Mark Langford (KR-2S) both broke nitrided crankshafts! That was a wakeup call! Dan decided to ground N183SX and put a extra bearing up front to take some of the flight loads off the crankshaft. You can look to Mark Langfords site and, of course, flycorvair.com for the complete story on cranks. Dan also decided to get a little help. His father, Jim Weseman, was building a Fisher Celebrity and considering engines. He had flown the Cleanex and liked the Corvair but also had other engines to consider. Jim Weseman is a long time Pilot, A&P IA, Engine Guru, home machinist, welder, and generally speaking a very creative guy! Knowing how Continental and Lycoming chose to handle propeller loads with a HUGE bearing up front, he was never thrilled with the bearing setup on the Corvair. While we were working on this we had a lot of requests for info but decided to test first. When this project was started, back in 2008, Dan and Jim had several ideas from the most simplistic approach to some very complex setups. They decided to go with a simple setup to take the bending load the propeller generates during flight off of the crankshaft and direct them into the case. In stock form the loads are taken between the #4 crank bearings and across the #6 rod throws. The basic idea was to put the load into the new 5th and #4 bearing. This takes the bending loads off the over stressed #6 rod throw and directs it to the new front housing and engine case. The thrust loads were also of some concern. The stock Corvair thrust bearing is at the other end of the crank. Aircraft engines have the thrust bearing up front, part of the HUGE bearing mentioned above. It is not hard to add a thrust bearing and remove the stock one, but it is hard to remove the existing one from a already assembled engine! Design decisions had to be made. Designing a thrust bearing would require the engine to be torn down for installation and require removal of the existing thrust bearing. Research showed the similar problems with the VW crankshaft and the non thrust add on bearing was a complete success story. Several others, including William Wynne and Roys Garage, were working on both thrust (WW) and non thrust (Roy) designs but both needed to be installed during build up, or a complete tear down and rebuild. After looking over the tolerances Dan and Jim decided they could do it as a bolt on for Dan’s engine he had installed in his Cleanex. It had been running great for over 100 hrs and Dan really didn’t want to tear it down and rebuild it just to start testing stuff. Once Jim was involved, and getting more knowledge on the Corvair, he was leaning toward using a Corvair and would need a unit as well. Chris Smith (builder of Son of Cleanex) also looked over what they were planning and asked if they would consider putting one on his. So more than one unit was needed! Dan had some foundry contacts so he decided to make a pattern and have the housing cast to reduce machine time and cost. The inner bearing was machined and carefully checked for run out. So, parts in hand Dan tore the Cleanex apart and installed the first unit. Things went well and they did the first test runs. After about 3 hrs on the ground he flew it for the first time. Things went as planned and testing was successful. In 2011 Dan modified the 5th Bearing Journal to accommodate new engine builds, reducing the installation time. This is now the preferred method for new engine builders. See more information HERE. There are over 320 of SPA’s 5th Bearing Retro and 2nd Gen units installed on Corvair flight engines to date. The last line says: “See more information HERE” but nothing happens upon clicking “here”. How do I get to “HERE” ? But, this is a very nice writing, would like to see more “here”! Looks like the link is working – not sure if there was another issue, but can you try again? Does your 5th bearing work on pusher designs? Yes, it will work on pusher engines if it is setup correctly. However it was not designed for this and it has not been tested in the field.